Date: 2nd Wednesday of the month. Location: Benton County PUD Auditorium, 2721 W 10th Ave, Kennewick (corner of US-395 (Ely St) and 10th Ave). 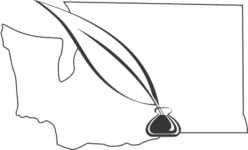 List of Tri City Genealogical Society Programs from 1961 through 2018 Past Programs by Year. Check out our previous Monthly Updates (single page of the society’s news for this and future months). If you have suggestions for a speaker or a program please contact our Vice President, Art Kelly who arranges for our programs.